In our pursuit to continue to select great shows and provide top quality performances at a very reasonable price, it sometimes takes a little extra padding in the wallet. So in exchange for your generous donations, we will be putting on a spectacular cabaret performance for you. 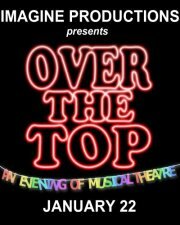 You'll see performances from all of our 2012 shows; Spring Awakening, Avenue Q, Hairspray, and The Rocky Horror Show. In addition, we'll be bringing you numbers from many other popular musicals like; Altar Boyz, The Full Monty, Gypsy, Into the Woods, The Producers, Reefer Madness, Rent, Spamalot, Shrek, Urinetown, The Wedding Singer, and You're a Good Man Charlie Brown. We will also be selling raffle tickets and running a 50/50 auction for some great items generously donated by our fantastic sponsors.